Remaining in constant movement, we implement new technologies and advanced developments professionally combining them with our own work experience, as always satisfied investor is our priority. Sure investment and permanent income finally became possible. 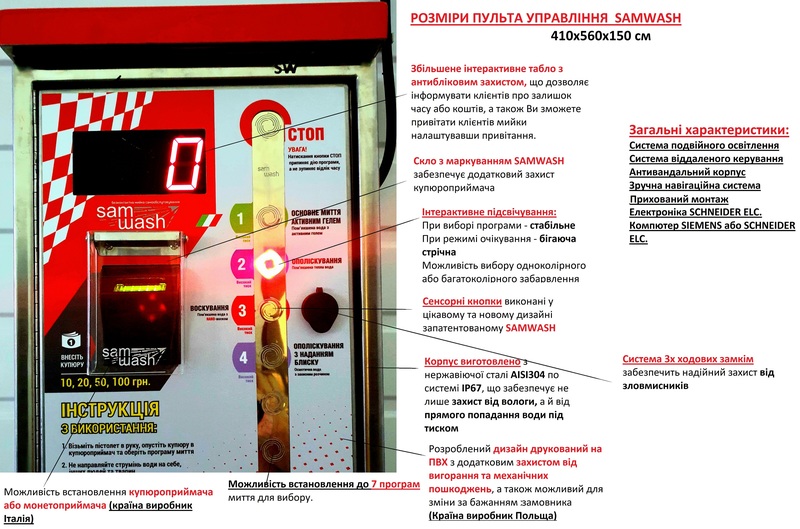 Considering relatively recent introduction of self-service car washes at the territory of Ukraine, as well as onrush of this trend, timely investment can become a smart move of successful investor. Self-service car wash does not require for time heavy spending and attraction of wage labour, as technological equipment works reliably at any time of year 24 hours a day. The significant advantages are business cash orientation and total absence of debit debts. Market novelty, innovative solutions, quality and reliable equipment and possible outfit variation allow to organize business flexibly according to certain needs of an investor. SAMWASH consultants will provide you with all information from allotment selection and designing to marketing. They will assist you on selection of optimum equipment, which will be manufactured by custom. You can get all information by e-mail, by phone or in person. The main criteria of prospecting site: location at the places with high automotive traffic, sufficient area for site for construction, possible connection to gas, water supply, electrical network and sewage facilities. Single washing platform occupies approximately 25 sq.m. Additionally, unhindered exit and entry roads to the car wash, places for future suction cleaners, parking and other associated products and services should be provided. SAMWASH provides a full range of services for designing and coordinating all necessary documents with the relevant authorities. Overall range of preparation and general construction works on your site will be carried out by qualified and responsible contractors, which will guarantee the quality of executed works. SAMWASH representative will coordinate works within the whole execution period. Car wash as a piece of art? Why not? Bridge concept will make your car wash the meeting point of people, who appreciate their own style in everything. You are not in favour of eccentric solutions, but do not want to get lost in city bustle? Sign concept will add special charm to your car wash.
SAMWASH presents freedom of experiments. Pixel company concept uses non-standard materials and visual solutions, which will touch feelings of your customers. Suction cleaner for car interior cleaning. Made of stainless steel, with one turbine. STOP emergency button is provided.